Welcome back. Vicki is reading a book on mindfulness. A year ago, I told her how impressed I was by a 60 Minute report she missed on the topic. I considered blogging about it, but there was so much available, I let it go. Then I saw a recent study on washing dishes mindfully. How could I let that go? 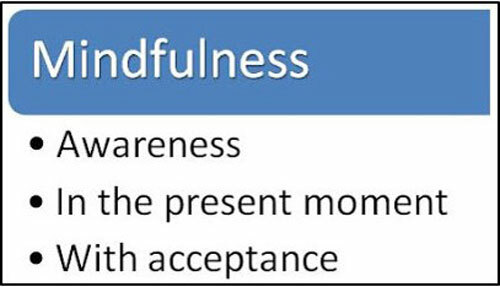 Some key points of mindfulness. Being an admirer not a practitioner of mindfulness, I can only relay what others have said. That’s particularly relevant as it pertains to what mindfulness is, which seems rather nebulous: Being aware of your thoughts, feelings, physical sensations and surroundings, living in the moment and awakening to experience. 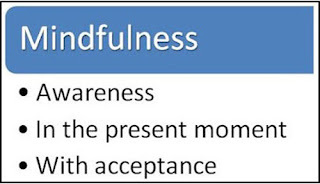 Mindfulness traces to Buddhist tradition--the word itself is from an element of Buddhist practice. Mindfulness-based therapeutic applications for psychological conditions have developed since the 1970s. Most notable is Jon Kabat-Zinn’s Mindfulness-Based Stress Reduction program, which was designed to assist with pain and a range of conditions and life issues. That and similar programs are now widely used in schools, prisons, hospitals, veterans’ centers and other settings. The dishwashing study was conducted by researchers from Florida State and Utah universities to investigate whether such an informal contemplative practice could promote the state of mindfulness and its related phenomena. 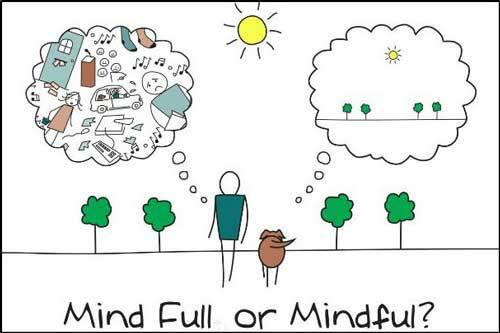 They noted that research has concentrated on interventions which combine formal and informal practices to foster mindfulness, yet experimental investigation of informal practices has lagged, despite the goal of integrating mindfulness with life’s activities. For their study, the researchers enlisted 51 undergraduates (33 females). After baseline testing, participants were randomly assigned to read either a descriptive dishwashing passage (25 students) or a mindfulness dishwashing passage, both of similar length (about 228 words) and reading difficulty. Participants then wrote and explained their interpretation of the passage and were timed as they washed the same prearranged set of 18 clean dishes. After dishwashing, participants completed standard self-reporting scales of mindfulness and affect, before being asked to recall features of their experience (number of dishes, soap smell, how long it took). 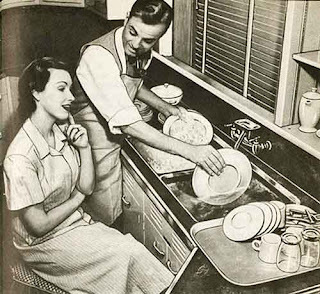 Those who followed the descriptive instructions showed no affective change; however, those who washed dishes mindfully reported significantly increased state of mindfulness and inspiration and significantly decreased nervousness, in addition to overestimating the dishwashing time. Warren and Vicki washing dishes? No. We have no aprons. After reviewing mindfulness for this blog post, I’m even more impressed than I was on first look, though it’s not something I feel pressed to practice since retiring. Oh, I worry about this or that--family, health, finances, the world situation, running out of milk, but I’ve been addressing those sorts of things for years, know what I can and can’t affect and usually find the humor in life. And lacking a dishwasher, I wash dishes as I go and am always inspired. Thanks for stopping by.